Walker's opened in August 2000 and is owned and operated by Master Mike Kadrovach. Mike is a Kukkiwon certified 5th Dan black belt. 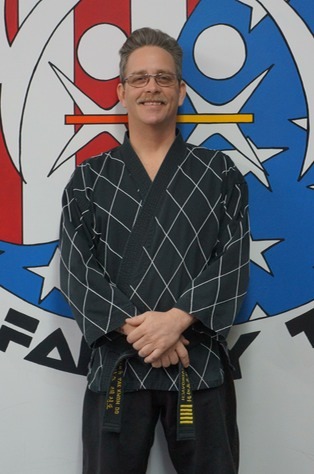 He began studying Tae Kwon Do at the age of 25, and has been studying and practicing in the Portage area for over 22 years. Mike's passion for Tae Kwon Do is readily apparent to all of his students. Mike's goals for his students are: (1) to be better than himself and (2) to strengthen their spirits with the "I can" way of thinking. "I can't" at Walker's, are replaced by "I'll try." At Walker's, the Ji Do Kwon form of Tae Kwon Do is taught. Ji Do Kwon is one of the major Tae Kwon Do associations, which is sanctioned by the World Taekwondo Federation (WTF, see inset left...) at the Kukkiwon in Korea. Practitioners of Ji Do Kwon are encouraged to live the philosophy upon which the art is built; to spread throughout the continents of the world the spirit of Ji Do Kwon. The spirit of Ji Do Kwon is getting up eight times when you have fallen seven times, standing upright in the face of all tribulations, and never giving in to failure.